Howard Schultz is the former chairman and chief executive officer of Starbucks Coffee Company. He grew up in Brooklyn public housing and was the first in his family to graduate college. After founding a small cafe business, he bought Starbucks, which grew from eleven stores to more than 28,000 under his leadership. In 2018, Starbucks ranked fifth on Fortune’s list of “World’s Most Admired Companies.” Howard and his wife, Sheri, co-lead the Schultz Family Foundation. 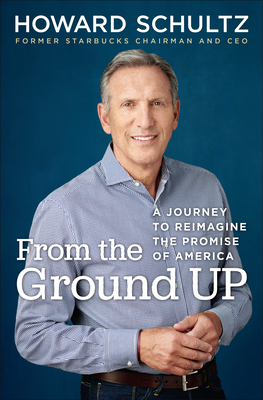 His other books include Pour Your Heart Into It: How Starbucks Built a Company One Cup at a Time; Onward: How Starbucks Fought for Its Life without Losing Its Soul; and For Love of Country: What Our Veterans Can Teach Us About Citizenship, Heroism, and Sacrifice. Howard has been recognized for his passion to strengthen communities, and is the recipient of the Robert F. Kennedy Human Rights Ripple of Hope Award, the Horatio Alger Award, and the Notre Dame University Rev. Theodore M. Hesburgh Award for Business Ethics. He and Sheri live in Seattle and have two children.